The Infiniti Q70 invoice price and the true dealer cost are not the same. Note: The Infiniti Q70 pricing report below does not include rebates or incentives. 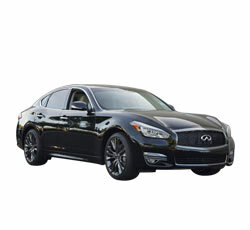 View Infiniti Rebates and Incentives. There's nothing quite like powering a Japanese sedan with a reliable V8 engine, and the 2019 INFINITI Q70 fits that description perfectly. Compared directly to its competitors, though, and the Q70 doesn't seem very impressive regardless of the equipment you throw on it. This year's model is part of a 2011 generation under a different name, and it has failed to keep up with the rest of the segment. Though it's a comfortable cabin, the design is dull after all these years, and the technology on tap doesn't help. It's also not a refined ride, especially if you're getting the sporty suspension and the bigger wheels, both of which make the experience outright choppy. Of course, neglecting to get these upgrades affects the handling. The 2019 INFINITI Q70 is part of the first generation of Q70, which INFINITI introduced for 2014. This year, there are no notable changes. The 2019 INFINITI Q70 luxury sedan has lots of character, but it's all thanks to the V8 engine, making the 5.6 Luxe the best trim to look into. Unless you live in a particularly nasty climate, it's best to avoid the all-wheel drive. However, you do want the ProActive package for its numerous safety benefits. Finally, the Sport package is hit-or-miss depending on your preferences; if you want better handling at the cost of ride quality, grab it. There are only two options for the 2019 INFINITI Q70: the 3.7 Luxe or the 5.6 Luxe. These trim names refer to the engine that powers it. You also have the option to get the Q70L long-base trim, which comes with similar equipment and either engine. The only transmission available here is a seven-speed automatic, and you get several choices of packages to customize your experience. At the base trim, you get a 3.7L V6 engine, which is capable of generating 330 horses and 270 lb-ft of torque. Dual-zone automatic climate control, heated front seats, and a sunroof all serve as protection from the elements. There's also an Essential package at no additional cost, which provides you with a heated steering wheel, parking sensors, and a top-down camera system for parking, along with a 10-speaker Bose premium sound system. Beyond this, there's the Premium Select Edition, which gives you the option to add 20-inch wheels, suedelike materials, dark exterior trim accents, and upgraded leather upholstery. With the 5.6 Luxe trim, you get the beefier 5.6L V8 engine, which generates 420 horses and 417 pound-feet of torque. The 5.6 Luxe models come with everything from the lower trim. The variants sporting the longer wheelbases bear the Q70L name. Here, you'll get another 5.5 inches of legroom in the rear, heated rear seats, power soft-close back doors, and a 12-volt outlet for backseat passengers. In both cases, you can add the ProActive package for more safety features than come standard. These include lane departure warning, forward collision warning, blind-spot monitoring, and collision mitigation for the front and rear. For the longbase trims, you can add the Sensory package for an advanced Bose stereo system, luxury rear-seat upholstery, and exclusive interior trim. You can get the Sport package for either one of the standard wheelbase INFINITI Q70 levels. Here, you will also get the 20-inch wheels along with better brakes and a tighter suspension that result in better handling on the road. The 16-speaker Bose stereo also comes with this package, as do magnesium paddle shifters and a power rear sunshade. Finally, the Q70L has access to the Performance Tires and Wheel package, which also upgrades the brakes and adds 20-inch wheels. Again, these help with the handling but compromise on comfort. If you can say nothing else about the 2019 INFINITI Q70, it's that it's a genuine sports sedan. It has a massive V8 engine with plenty of power, and the brakes and steering both work well. The Q70 has much outdated about it, but the performance still stays strong. The engine lets the Q70 speed up smoothly at full throttle, although it's not quite as powerful as we'd like at the lower end. In real-world application, the 5.2 seconds to reach 60 miles per hour is more than sufficient for all your driving needs, but it's not very impressive considering the 420 horses. Make no mistake, though -- this is a speedy car. The Q70 does excel at confidence-inspiring braking. It's a firm pedal that you can control easily around town. Equipped with the all-season tires, the INFINITI takes a less-than-average distance to come to a complete panic stop from 60 miles per hour. Steering around the corners rewards you with accurate responses, and there's little effort involved at parking-lot speeds. Overall, the Q70's steering is excellent for the segment. On twisted, winding roads, the 2019 INFINITI Q70 feels quick and agile, eager to turn and travel like it's smaller than it is. There's too much bounce in the base trim to take the INFINITI out for real sports driving, but you do have access to a Sport package to make that a possibility. The transmission has smooth downshifts when left in Manual Mode in the city, but it's a little slow to engage when you're trying to merge in Drive Mode. Still, it's a generally annoyance-free drive. Example: Base Infiniti Q70 invoice price + the dealer Invoice price of options + destination - Holdback = Total Dealer Cost. Note: All Infiniti Q70 MSRP, invoice and dealer cost dollar figures above are approximate amounts. Prices are subject to change without notice.